The story starts in the 1970/71 season when Wolves first wore a proper badge on their old gold shirts for the first time. 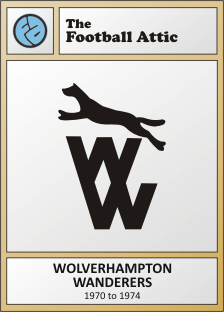 They'd worn the Wolverhampton coat of arms during the 1947/48 season, but the Molineux club opted to leave their shirts unadorned until the start of the 1970's when a new badge featuring a wolf leaping over the club's initials appeared in black. This was an exciting time to be a Wolves fan. After something of a decline in the 1960's, manager Bill McGarry steered his team to a fourth place finish in Division One in 1970/71. 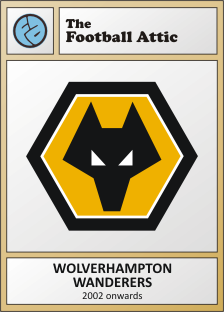 The following season they reached the UEFA Cup Final, losing out eventually to Tottenham, and in 1974 Wolves won the League Cup Final. 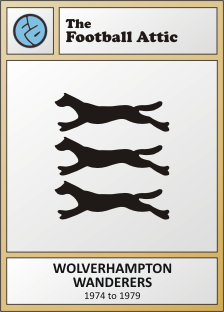 It was for this latter event that a new badge appeared, this time featuring three leaping wolves in vertical formation. 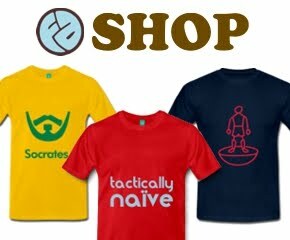 Over the next five years, the three wolves appeared centrally on the shirt while further identification was provided to the right in the form of the letters 'WW'. 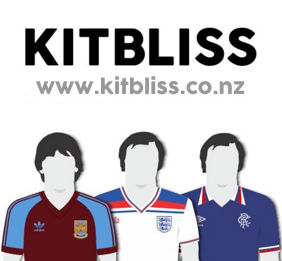 Having been a mid-table team in the First Division for some time, they were eventually relegated in 1975/76, but this started a period in which they became something of a yo-yo club. In 1976/77 they were Second Division champions, in 1978/79 they finished two places above the First Division relegation zone and in 1979/80 they finished sixth in the top flight (qualifying for the UEFA Cup again), with another League Cup win at Wembley to boot. 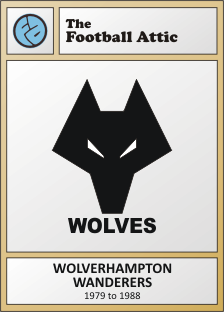 By the time Wolves defeated Nottingham Forest in that League Cup Final, a third badge had arrived. This time an angular Wolf's head was the motif above the club name in a Helvetica-style font. With big-money signing Andy Gray leading the way on the field, things looked bright but it was something of a false dawn as further ups and downs were witnessed by the fans. Relegation in 1981/82, promotion back to the First Division in 1982/83, relegation again in 1983/84, then two further relegations in successive seasons ultimately saw Wolverhampton Wanderers in Division Four and in a parlous state. 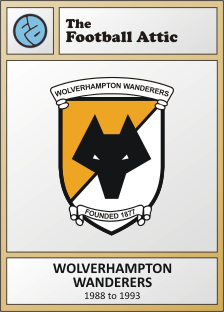 Before a change of fortunes materialised, Wolves introduced a new badge in 1988 featuring the wolf's head this time presented in a two-tone shield with ribbons above and below displaying the club's name and year of formation. A combination of old and modern styling, this seemed to be a pleasing compromise that no doubt appealed to many of the fans, but it didn't last that long. With the arrival of Steve Bull, Wolves had a steady source of goals again and the club quickly climbed the league structure, winning the Fourth Division title in 1988 and the Third Division title in 1989. Another trophy was added to the display cabinet with a Football League Trophy win in 1988. It was at this point that Sir Jack Hayward purchased Wolverhampton Wanderers and invested substantially towards its recovery. 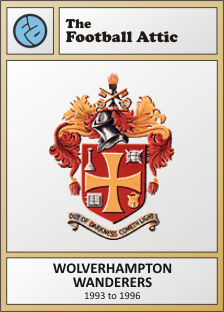 While that was happening, Wolves ditched the old club badge and replaced it with the Wolverhampton coat of arms which, as mentioned, had appeared for a single season in the late-1940's. Yet even that didn't last for long. Having appeared on the team shirts for the first time in 1993, it too was replaced in 1996 at which point a somewhat crude exaggeration of the old wolf's head logo was seen as being fit for purpose. 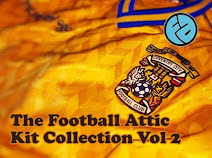 All through the chopping and changing of the badge, Wolves remained in the second tier of English football but when the breakthrough came in the form of promotion to the Premier League in 2003, they'd already switched to the badge they wear today. The wolf's head, now with right-angled triangles for eyes and contained within an old gold hexagon, has, by the club's standards, been in place for a long time now. Whether you like it or not, it has at least proven to be more consistent in recent times than the club's own fortunes as life in the third tier beckons for next season. 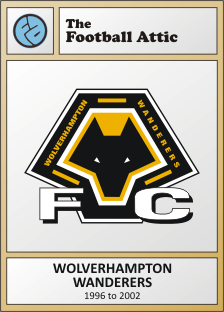 Which Wolverhampton Wanderers badge is the best? The Worst of Modern Football - The Final!